The breadwinner of three families, Louis Cheung (張繼聰) is going through a tough time. The actor-singer, who stars in the anniversary drama Two Steps from Heaven <幕後玩家> alongside Bosco Wong (黃宗澤) and Edwin Siu (蕭正楠), hasn’t recalled a time in his life when he has been this busy. In April, Louis’ wife Kay Tse (謝安琪) announced at her concert that she would be taking a hiatus, as she is expecting her second child, a daughter, with Louis. The couple married in 2007, and their first child, son James, was born that year. It has always been a dream of Louis and Kay to have a daughter, but at 39 years old, Kay is in a high-risk pregnancy. She is now resting full time; with Louis at work, Kay’s mother and her mother-in-law are taking care of her. As the breadwinner for not only his wife and son, but also their parents, Louis has to grasp onto any work responsibility. Within the year, Louis has shot seven commercial films, six movies, made a handful of show appearances, and filmed the television drama Two Steps from Heaven, which is currently airing. He was also cast in an upcoming grand production with Bobby Au-yeung (歐陽震華) and Moses Chan (陳豪), which starts filming within the next few months. According to a tabloid source, Louis earned about $3 million HKD in three months. Under high stress, Louis has, unfortunately, gotten back to heavy smoking. The Momentary Lapse of Reason <收規華> star once said he wanted to quit for his son, but the actor, unable to find ample time to relax, resorted to heavy smoking again to relieve his stress. Louis was recently spotted smoking a few cigarettes in the balcony during a celebration party for Two Steps from Heaven. Although he was talking and joking with friends, he looked visibly tired and stressed. No job, got stress. Got job, also stress. He is already skinny. Smoking won’t relieve stress but makes things worse unless he smokes to stay thin. Cut down on expense then no need to stress so much. Heavy smoking is not good for the body. Especially when his kids and wife is inhaling 2nd hand smoke. @happybi smoking is a waste of money and unhealthy to himself and those breathing in 2nd hand smoke. but like what funn mentioned, no job stress, have jobs also stressed. This journalist seems to make up stories by him/herself. Based on 1 picture and he smoking can already know he is under extreme stress and not happy? Wow. You dare to write, I also ashame to read. Agree…perhaps it’s just a coincidence that he was smoking when the journalist took this picture. But it’s not a solid proof that he becomes a heavy smoker again to relieve stress. 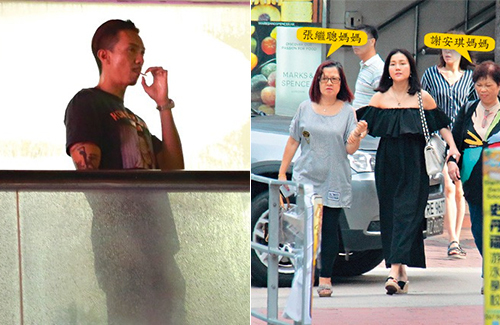 There are so many TVB artists who smoke too. Anyway, Louis is a talented guy. I like him after watching his good performance in Momentary Lapse of Reason…he can act. Hope to see more of him in TVB dramas. Smoking is never the only option to relieve stress. Omg!! Seriously? If he’s really stress over money what’s the point of having another child? Raising a child needs lots of money too especially for diapers and milks this day they’re very expensive. I hope this is just a junks news.